[117 Pages Report] The global smart gas meters market is expected to grow from an estimated USD 1.59 Billion in 2016 to USD 2.27 Billion by 2021, at a CAGR of 7.24% from 2016 to 2021. Factors such as government policies & mandates in developed economies and accurate billing & improved customer service are driving the market worldwide. For company profiles in the report, 2015 has been used as the base year. Wherever recent (2015) data was unavailable, the previous year (2014) data has been included. This research study involved extensive usage of secondary sources, directories, and databases (such as Hoovers, Bloomberg, Businessweek, and Factiva) to identify and collect information useful for this technical, market-oriented, and commercial study of smart gas meters. The points mentioned below explain the research methodology applied in making this report. The smart gas meters market starts with the manufacturing of basic components including meters and related accessories. 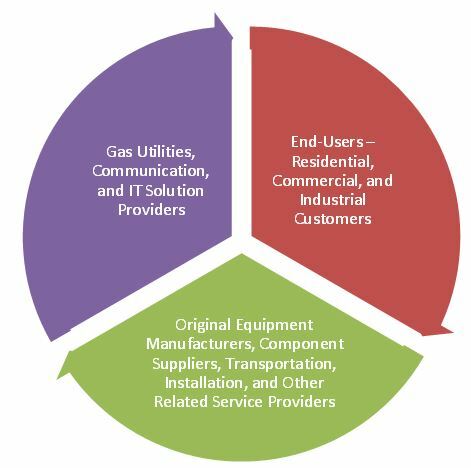 The final stage covers gas utilities, solution providers, and end-users. “The study answers several questions for the stakeholders, primarily which market segments to focus in next 2-5 years for prioritizing efforts and investments”. The smart gas meter market is projected to grow at a CAGR of 7.24% from 2016 to 2021 to reach USD 2.27 Billion by 2021. Government policies & mandates in developed economies and accurate billing & improved customer service are the major factors driving the market. The report segments the smart gas meter market on the basis of end-user into residential, commercial, and industrial. Residential customers are the largest end-users of smart gas meters, followed by commercial and industrial customers. The global gas pipeline network construction in the residential segment has accounted for 1,054 km (approx.) in the past 5 years and another 100 kms are expected to be constructed in next 2-3 years, which would boost the smart gas meter market in this segment. Based on type, the smart gas meter market has been categorized into AMR and AMI. The AMR segment is estimated to be the largest market for smart gas meters in 2016, owing to its cost effectiveness. The AMI market, on the other hand, is projected to grow at the highest rate during the forecast period because of its technological superiority. In this report, the smart gas meter market has been analyzed with respect to four regions, namely, Asia-Pacific, North America, Europe, and Rest of the World. North America is currently the largest market for smart gas meters, followed by Europe and Asia-Pacific. Factors such as investments in smart grid, smart city & gas pipeline networks, and drive towards reducing carbon emissions would positively impact the smart gas meter market globally. The figure given below shows the regional scenario of the smart gas meter market from 2016 to 2021. The demand for smart gas meters can be directly linked to the development of gas pipeline networks and investments in smart cities & smart grid infrastructure. Health and cybersecurity issues related to the usage of smart gas meters could restrain growth to a certain extent, with customer unwillingness and interoperability issues being significant challenges of this market. However, smart grid investments offer lucrative growth opportunities for the smart gas meter market. 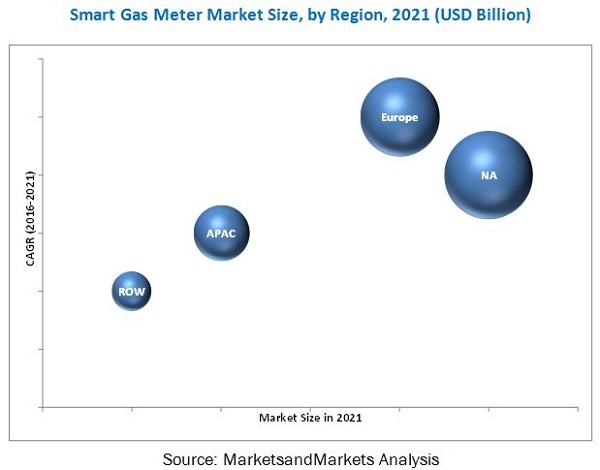 Some of the leading players in the smart gas meter market include Apator Group (Poland), Diehl Metering (U.K.), Honeywell International, Inc. (U.S.), Itron Inc. (U.S.), Landis+Gyr (Switzerland), and Sensus (U.S.), among others. Contracts and agreements was the most common strategy adopted by the top players in the market, constituting more than one-third of the total development share. It was followed by new product launches, expansions, and mergers & acquisitions respectively. 10.9 Chongqing Shancheng Gas Equipment Co. Ltd.